In the past few months, we've received requests from multiple administrators to provide a way to view a list of users, from their organization, who are using PowerApps, Microsoft Flow, or both. Many administrators were also interested in knowing the licenses of these users. 1. Click or tap Download a list of active user licenses. The file might take a few minutes to download. 2. Wait a few minutes for the .csv file to download, and then open it in Excel. Note: If you close the window before the file finishes downloading, you might have to restart the process. This example shows two users who have licenses to both PowerApps and Microsoft Flow through different means. Jane Doe has access through a subscription to Office 365, and John Doe got a trial license for each product. Both users have accessed PowerApps or Microsoft Flow. 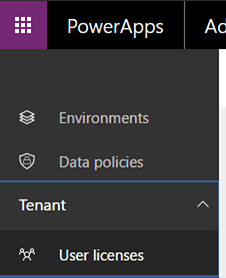 There might be more users in the organization who have license to access PowerApps and Microsoft Flow, but have never accessed these products. These users will not appear in this list. You can view all the user licenses from Office 365 admin center. If a user has left the organization, the list will show Unknown in columns such as User name and Email address. Also, there is a known-issue where some of the columns might still have value as Unknown even for the users who are still in the organization. In such a case, please try downloading the file again after a few minutes. If you want to add more user licenses, then you can do so from Office 365 admin center.